Good riddance to Joel Kleefisch BB Extended Sports Coverage! Go Brewers!! Is West Virginia Leading The Nation Towards Single Payer Health Care? Earlier this week the Milwaukee Journal Sentinel reprinted an article in their Ideas Lab from Kaiser Health News reporter Julie Revnor. I have the hard copy but online I found it on the NPR site. The article wrangles with the notion of who is really protecting the Affordable Care Act’s clause to cover Americans with pre-existing conditions. It includes some discussion on the senatorial race in Wisconsin between incumbent US Senator Democrat Tammy Baldwin and her opponent State Senator Republican Leah Vukmir. It is worth the read. But what caught my attention was the last paragraph where Ms. Revnor is debunking a statement made by the US Senator from West Virginia, Joe Manchin. An example is Manchin’s claim about the threat to coverage for 800,000 people in West Virginia. West Virginia’s population is only 1.8 million and more than 1 million of those people are on Medicare or Medicaid. That would mean every other person in the state has a pre-existing condition. A recent study found West Virginia has a relatively high level of pre-existing conditions among adults, but it is still less than 40 percent. I am not going to fact check Senator Manchin’s claim…the fact that any American might lose coverage because of a pre-existing condition is enough of an issue on its own (full disclosure: I have a pre-existing condition, I had a heart attack in 1999 and am being treated for heart issues to this day). But what I found more interesting was Ms. Revnor’s assertion (and I didn’t fact check that either…she does this for a living so I am taking her at her word here) that over 1 million out of 1.8 million West Virginians are on Medicare or Medicaid. Fifty five percent plus of West Virginia is on federally sponsored single payer health care already. So apparently it works and works fine. So it wouldn’t be much of a push to get those other 44+% of West Virginians on Medicare for All (yes I hate that name because it isn’t factual but I am going to use it because it’s become the vernacular for comprehensive universal single payer health care that I support). Maybe we should just make West Virginia a test bed and set up a universal single payer plan in just that state. I would think the population would be amenable seeing how the majority are already on similar plans. (just another aside: those on Medicare and Medicaid don’t have to worry about pre-existing conditions. Medicare can’t deny anyone who is old enough to be eligible and Medicaid can’t either and parts of it are essentially designed to cover pre-existing conditions). And it probably won’t be hard to convince the estimated 267,000 previously uninsured West Virginians using the Affordable Care Act to move either. To me there should be a national move to a comprehensive universal single payer health care system in the United States…but since there is nothing but argument around it…let’s go with a test in West Virginia. It’s a small population…55% are already on a federally run single payer program…and they are close enough to Washington to be a decent social laboratory. Too bad their ‘good neighbor’ to the West (Senate Majority Leader Mitch McConnell) wants to cut back on Medicare and Medicaid. But that might make it easier for WV to volunteer to be the guinea pig here. BTW: West Virginia’s electoral votes in 2016 went to President Donald Trump who pulled in 68.5% of the vote with only 57.45% turn out. And this late breaking tidbit. While researching a few of the items above, it looks like Sen. Manchin might not be so far off. 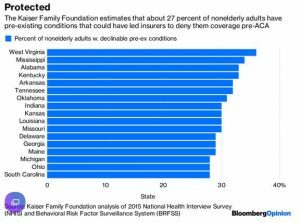 This Kaiser Family Foundation chart (from 2015) shows West Virginia having about 35% or so residents with pre-existing conditions that could have been denied coverage pre-ACA. Interesting.